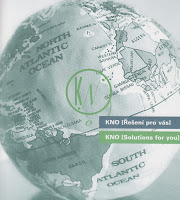 KNO is always working with clients to strengthen their approaches to evaluation of performance and training initiatives. Our Partners are all ISPI Certified Performance Technologists (CPTs) with many years of assessment and evaluation success. Recently, two KNO Partners have also become Kirkpatrick Certified for program evaluation. We seek to work with our clients to design training flowing down from the business results demanded. On the front end, we conduct a simple PiP analysis to estimate a potential return on investment if a proper performance solution is selected, designed and implemented. We find that in almost all cases that real success requires a grouping of parallel efforts to address all components of performance: clear expectations, knowledge/skills, incentives, ongoing feedback loops and adequate resources. 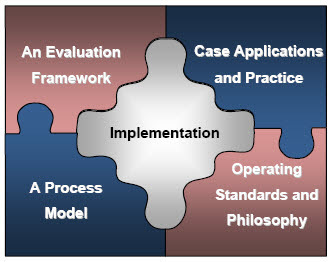 There are different models for approaching the evaluation task. A very common method, the Kirkpatrick 4 Level Evaluation, is a starting point for most organizations. This links high end business results to required staff behaviors. Training can then be designed with objectives to build the required knowledge and skills, that are supported by in the workplace by multiple "drivers". These can include such tools as job aids, coaching, action-plan followup, process checklists, refreshers and recognition with peers and bonuses. We know from research that too much energy is spent on investigating participant reactions to the training and very little on training transfer of behaviors and linking to the business goals. These levels of resource expenditure and energy are reversed with those clients who actually succeed in implementing the desired changes in performance. 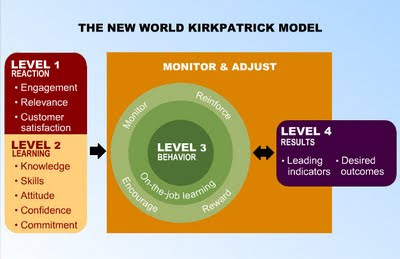 In addition to the Kirkpatrick approach, Robert Brinkerhoff has conducted extensive research and advances alternative options such as the Success Case Method (SCM) and the Learning to Performance Model. 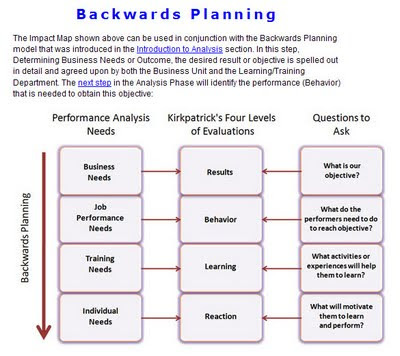 Donald Clark combines several methods to depict what he calls Backwards Planning to the same effect. 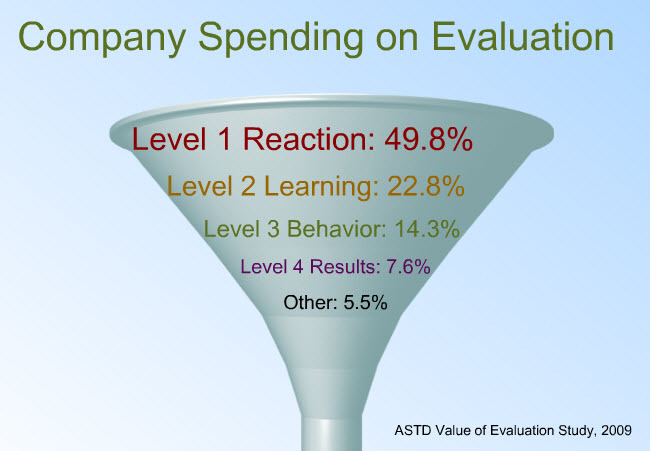 Jack and Patti Phillips of the ROI Institute have further refined an ROI methodology for measuring and evaluating programs - sometimes referred to as Level 5. All of these successful approaches focus on the end results at the beginning. Before any training even starts to be designed, the objectives are derived to create behaviors that will support the critical strategic and operational results.